Everyone talks about self-hosting, but what about those of us who use a free blog? Ever since I fell into the world of blogging I've read dozens and dozens of posts on why it's best to set up a self-hosted blog - all the money you can make, all the plug-ins and added extras you can access, all the bells and whistles that blogging for free doesn't give you. But you know what, I've been blogging for two and a half years and (other than buying my domain name) it has cost me nothing, zero, zip, zilch. I don't use my blog to earn an income, so I have the freedom to stick with my free Blogger blog, to play around with it and enjoy it, without having to worry about all the problems I read about that come with having a blog that is bigger than Ben Hur. 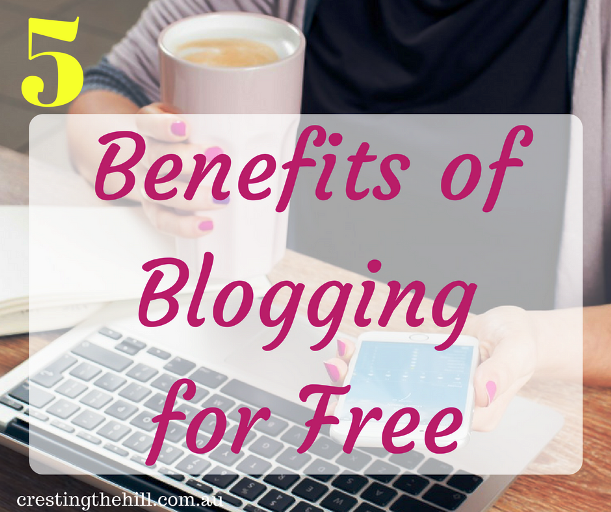 I thought I'd take a moment to share what I love about using a free blog. It has always surprised me that people read what I write and enjoy it, and take the time to comment and share their thoughts. Because I'm not looking to gain a reward from how many views I receive, I can enjoy each and every person who stops by. Whether I have 100 views of a post, or 1,000 views it's irrelevant - what matters is what I'm writing and if people would like to read it then that's a fantastic bonus - but not a necessity. I know so many bloggers who choose what they write about based on how many people that particular post will attract. So many bloggers have swapped to writing about how to blog and how to make money from blogging - not me, I write about stuff that I like to read. I write about stuff that affects my world and I love being able to do that without having to change my topic or my style to keep my readership up to a certain number. I don't have to write seasonal posts to fit anybody's framework. I can choose to write about Christmas or Easter or Valentine's Day if it's that time of the year, or I can write about something completely off the subject - it doesn't matter because I'm not tied to anyone else's agenda. If an idea pops into my head, then I write - I love the freedom of going where my whims take me. If you pay a lot of money to own your blog, to buy all the training packages, to pay for the images you use, and to try out all those bells and whistles, then you need to make money to cover your costs - and hopefully to make a profit. That's great if you love approaching sponsors, if you love writing about products that show up on offer in your email, and if you like chasing down the elusive dollar. I don't need to do any of that because I have no costs to offset. I have a great regard for those who make a living from blogging - but it's not my path in life, so a free blog fits beautifully when it's a leisure activity. Ultimately, because I use a free blog to write, I can have fun and enjoy the process. I know you can do that and still make money, but there is no pressure on me at all. I don't feel the need to run ads, I don't need to promote anything that doesn't really interest me, I don't need to do anything except write and connect and write some more. Perhaps more people would jump into blogging if they knew they could do it for free and still have an attractive blog that other people want to visit. So, for every blogger earning their living from what they do, and waxing lyrical about the joys of owning their blog, I'd just like to say that there are people like me who are enjoying the process for free and not feeling the need in the slightest to join the self-hosted bandwagon. So, thank you to Google for their lovely Blogger site, I am one of your millions of satisfied customers and I couldn't be happier. Hi, Leanne - While I do have a (non-monetized) self-hosted blog, I TOTALLY agree with your points above. 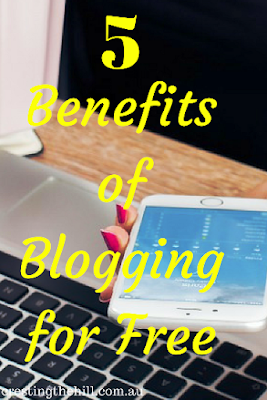 Blogging for yourself, and for the sheer love of blogging is a great joy -- whether using a free site or self-hosted. And, as there are some drawbacks to self-hosted blogs, I am glad to hear a shout-out for the free Blogger site. Finally someone addressed this issue. I blog for me and hopefully reaching people and helping them. No money needed. Thanks for linking up with Blogging Grandmothers. I'm pretty much the same Candace - I totally "get" and quite admire bloggers who get paid to write, but I don't think I'll ever be one and I'm not prepared to trade off my freedom because I'm trying to pay for my blog page. I am so happy you've put this into words, Leanne! I too use Google Blogger and want only to write lifestyle pieces and from my heart. Nothing to promote, no one to impress. It does keep us in the shadows; perhaps even frowned upon by those savvy and gaining financially. But I view my blog as a tool I've been using all my life...journaling what's in my heart and soul; whimsy here and there, funny, sad or irrelevant. I am always grateful for feedback...especially when someone takes the time to read me!! You have bailed it perfectly...keep up the good word! I can see that you totally get it Joan - it's not about which is right or wrong, just that so much is said about paying for this, that and everything so that your blog will be seen and stand out. What I don't see is people like us who are really happy with what we have - where we can express ourselves and not feel the need to turn it into a money making enterprise or a bill paying endeavour. For me it's about connection, nothing more and nothing less. I've been using Blogger for 2 1/2 years and I love it - straightforward and easy to use. If I ever turned my blog into a business and started making megabucks, then I might transition across to something flasher. But atm I'm very happy and I think it's important to acknowledge such a great free resource. I get what you're saying and although I do have a self-hosted blog and I do have some ads on it, it doesn't matter if it makes money or not, would be ok if it did but not necessary :) I'm just enjoying connecting and making new friends (like you) all over the world, especially midlife women (grandmothers like me in particular). Thank you Leanne for sharing at #BloggingGrandmothersLinkParty #LinkUp #BlogParty. I shared on social media. It's all about the connection isn't it Dee? I find there are so many different styles of blogs out there and most of the time I can't tell whether they're expensive or not - I'll stick with the frugal option for now and enjoy it guilt free. Wow! Eight years Alana - that's a LOT of blogging and I'm so glad to hear that Blogger has been sufficient for you all that time. It's nice to think you can keep tinkering away on a free site without the need to upscale and increase the outlay. Leanne, I've been perfectly content with Blogger for 7 years of weekly posts now. I do get paid to write, was a freelance writer before I was a blogger, but I decided at the outset that I did not want to "monetize" the blog with ads. Some blogs I visit have ads and they are okay, but so many I come across have too many ads, annoying pop-ups, huge pop-ups asking me to subscribe before I've even had a chance to read the blog. I love your blog -- how it looks, how it functions, what you write, how you write -- keep up the good work! Jean that was such a lovely and encouraging comment - thank you so much! I hadn't realized you'd been blogging for so long. I'm no cook, but whenever I see your blog I think how clear and pretty it is and the photos of the food you cook are always so tempting. If you can produce that for 7 years on Blogger then I know that I'm onto a good thing! I enjoyed this post, Leanne. I also blog for free but I do feature my children's books on my blog. My blog doesn't rotate around my books but rather about the reading, writing and baking hobbies that inspire them. I think free blogging gives us so many options without necessarily having to sign up to be self hosted or pay for a theme or whatever Robbie. If you're prepared to adapt what's on offer it can be more than enough. Unlike you, I came reluctantly to blogging. I'm a picture book author, and I had to create a website for my books, and a blog for my website. But I have steadfastly refused to monetize my blog. I don't have affiliate links. I don't have sponsors. I blog about things that interest me. Picture books, saints, recipes, disability issues ... it's somewhat random. And I love reading what other people have to say on their quirky, random blogs. Thanks for sharing yours! Even a reluctant start can still be a great opportunity Charli. Not monetizing and not covering everything in ads and pop-ups can mean so much freedom. Writing about what you love is the key to enjoying blogging IMHO. Amen to all of that. I blog because it relaxes me. It something that I do for me and not other people. Thanks for posting this. I'm exactly the same - I love that others read my posts, but if I'm not writing about what is authentically "me" then why bother in the first place? You make excellent points and people need to understand how much work it really takes to make money blogging! If bloggers are into writing, there is always the freelance path, one that I have chosen to take. I write blog posts for my bro-in-law's company and make a little $$ at it. Really just enough to buy a premium theme or invest back into some perks for my blog. Glad you wrote this and we can all learn great things from it! You've nailed it Terri - if you make money from blogging or you have spare money to throw around, then by all means spend it on making your blog bigger and better. BUT if you are like me and don't want to go down that path, then you can still have an amazing time without spending any money at all. This post made the most clicked on the Blogger's Pit Stop. Be looking for a feature on Friday. Well done. It's really all about what blogging means to you isn't it? If you want to make money then you need to spend money in the process. If you're just having fun then you can do it for free and that's an amazing blessing. Ain't nothing wrong with a free WordPress blog. I've set up three in the past two weeks, for people who wanted to start a blog but didn't know how.